Building with Ionic type columns. Ḵūrha, Markazī province, Iran. Parthian period (ca. 150 BC - AD 224). Excavations of A. Hakemi (Iranian Department of Archaeology), 1956, and M. Rahbar (Iranian Center for Archaeological Research, ICHTO), 1977 and 1996- . L. ca. 50 m, W. ca. 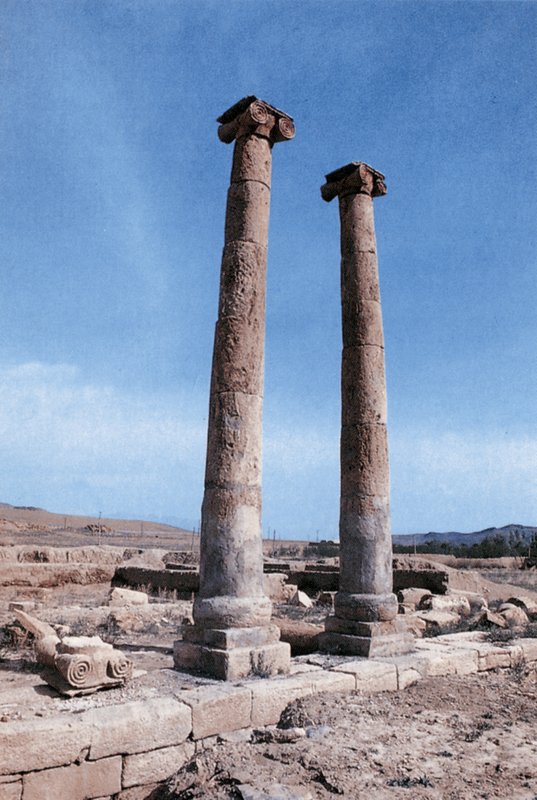 33.50 m.
Standing columns, crowned with Ionic type capitals and reaching more than seven meters in height, made the ancient ruins in the middle of the plain of Ḵūrha conspicuous through the ages (e.g., in the tenth century AD, Qomi 1934: 67-68). Ernst Herzfeld was the first western archaeologist who paid attention to the site, visiting it twice in the 1920s (Herzfeld 1920: 32; idem 1926: 235-236). He interpreted the ruins (before excavation) as those of a Seleucid temple. 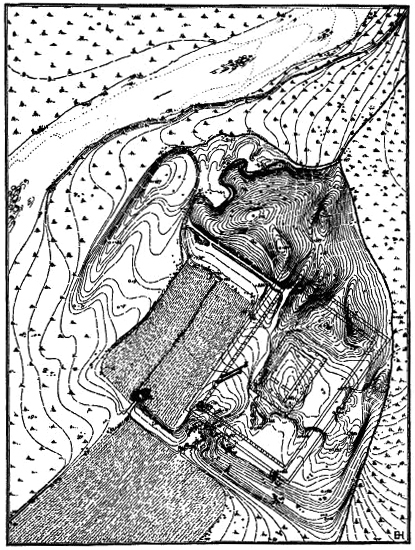 Affinities with Greek architecture, as evidenced by Ionic type capitals, as well as surface indications on the low mound of the site, led him to visualize a Greek peripteral temple plan with a cella in antis. The vine trees covering the surrounding plain at the time of his two visits supplied reason for his further suggestion that the 'temple' would have been dedicated to the Greek god of wine, Dionysus (Herzfeld 1935: 50-51; idem 1941: 283-285, pl. LXXXVIII, reconstructed plan of 'temple' p. 283 fig. 382). 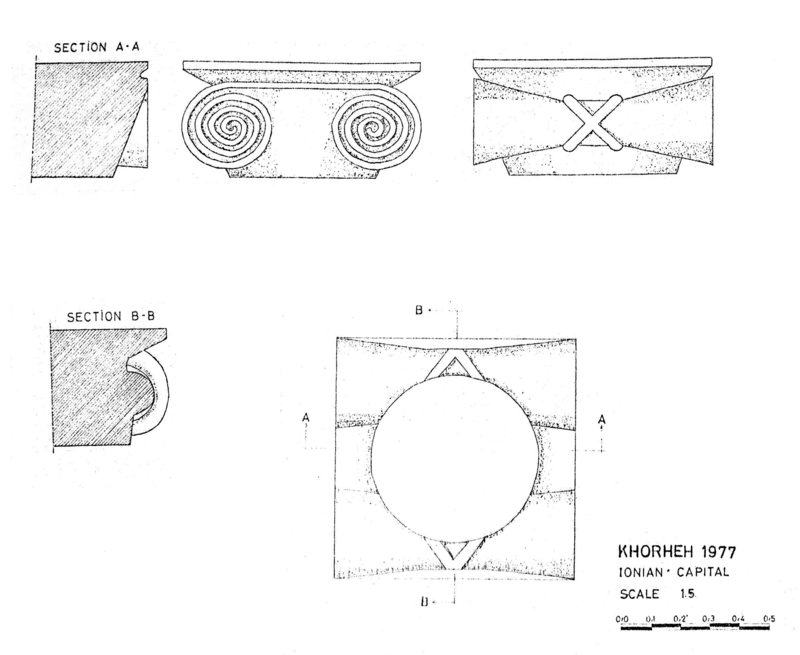 Ceramic materials obtained in the course of excavations at the site by Ali Hakemi in 1956 (Hakemi 1990) and Mehdi Rahbar from 1996 onward (e.g., Rahbar 1999; idem 1382/2003), as well as a number of separate evaluations and studies of the forms of the surviving column bases and capitals (Colledge 1967: 124; Bernard 1969: 337 n. 1; idem 1972: 249; Kleiss 1973: 173-174 and figs. 9-10, 180-182 and figs. 18-19; Lecuyot 1993; Rahbar 1999: 46; idem 1382/2003), all point to a date during the Parthian period for the construction of the monumental building. 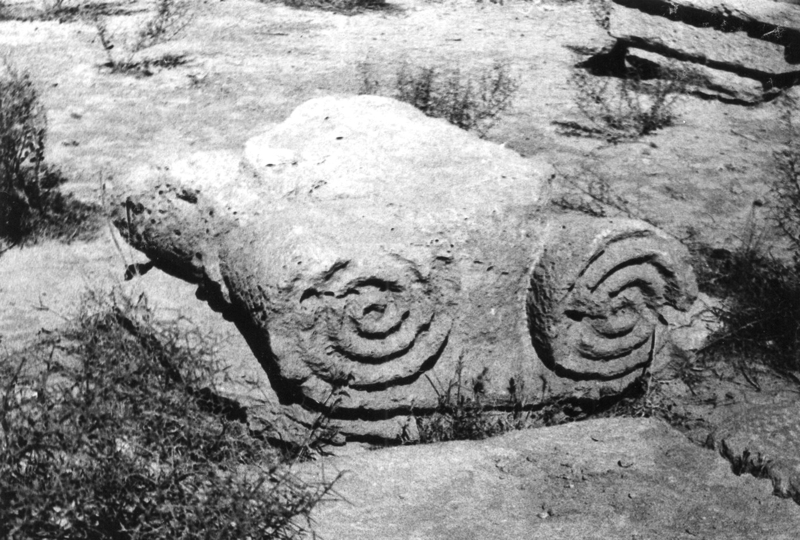 In current opinion, the Ionic architectural features attested at Ḵūrha most likely formed a part of a Parthian secular architectural creation —either a palace and station on the nearby major Qazvīn-Sāveh-Eṣfahān route (Kleiss 1981; idem 1985: 173-174) or an aristocratic residence (e.g., Rahbar 1382/2003)— whose outlook was 'inspired by Achaemenid and Seleucid princely architecture' (cf. Rahbar 1999: 46). ——. 1972. 'Colonnes greco-bactriennes d'Ai Khanoum (Afghanistan).' The Memorial Volume of the Vth International Congress of Iranian Art and Archaeology: Tehran – Isfahan – Shiraz (11th-18th April 1968). Tehran: 239-250. Bivar, A. D. H. 1969. ‘Review: Malcolm A. R. Colledge, The Parthians (Ancient Peoples and Places vol. LIX). London: Thames & Hudson, 1967.’ Journal of Roman Studies 59: 307-308. Colledge, M. A. R. 1967. The Parthians. Ancient Peoples and Places LIX. London. Drechsler, A. 1999. Geschichte der Stadt Qom im Mittelalter (650-1350): politische und wirtschaftliche Aspekte. Berlin. Hakemi, A. 1990. ‘The excavation of Khurha.’ East and West 40: 11-41. ——. 1926. ‘Reisebericht.’ Zeitschrift der Deutschen Morgenländischen Gesellschaft n.s. 5, 80: 225-284. ——. 1935. Archaeological History of Iran. The Schweich Lectures of the British Academy, 1934. London. Kleiss, W. 1972. ‘Bericht über Erkundungsfahrten in Iran im Jahre 1971.’ Archäologische Mitteilungen aus Iran 5: 135-242. ——. 1973. ‘Qal’eh Zohak in Azerbaidjan.’ Archäologische Mitteilungen aus Iran 6: 163-188. ——. 1981. ‘Bemerkungen zum Säulenbau von Khurha.’ Archäologische Mitteilungen aus Iran 14: 65-67. ——. 1985. ‘Der Säulenbau von Khurha.’ Archäologische Mitteilungen aus Iran 18: 173-179. ——. 1994. ‘Beobachtungen in der Umgebung von Dodehak.’ Archäologische Mitteilungen aus Iran 27: 205-221. Lecuyot, G. 1993. 'Résidences hellénistiques en Bactriane, résidences parthes en Iran et en Mésopotamie: diffusion ou communauté d’origine?' Mesopotamian History and Environment, series 1, Northern Akkad Project Reports 8: 31-45. Rahbar, M. 1999. 'Une résidence parthe sur le Plateau iranien’ [translated and adapted by Mousavi, A. and Boucharlat, R.]. In Empires perses d’Alexandre aux Sassanides. Dossiers d’Archéologie no. 243. Dijon: 44-46. Rowland, B., Jr. 1935. ‘Notes on Ionic architecture in the East.’ American Journal of Archaeology 39: 489-496. Schippmann, K. 1971. Die iranischen Feuerheiligtümer. Religionsgeschichtliche Versuche und Vorarbeiten 31. Berlin.